Solar technology has definitely arrived in Utah. Did you know that the roof is one of the major determining factors on the impact of a decision to go solar? Every roof is different and there are some key factors that need to be considered before making a decision. The roof orientation, tilt, shingle type and the age of a roof could make all the difference between saving thousands of dollars or not saving at all. There are four directions solar panels can be installed: north, south, east and west. Each direction affects the production of energy flowing into a solar system. Solaroo Energy explained the benefits and disadvantages of each direction solar panels might be placed on a home. South-facing panels are by far the highest producers of solar energy to a home. The sun shines in the southern sky for most of the year — the more sun, the more production. There really is little to no disadvantages to south-facing panels. East-facing panels often get a bad rap for not being a viable option for solar production. However, this is the second most efficient placement for panel installation. Homeowners often assume that because the west side of a home seems to be the ‘hot spot’, it must also produce the most energy. The reality is this: heat does not equal production — sunshine does. In fact, most solar panels operate more efficiently in cooler temperatures. The morning sunrise, then, is generally a better producer of power than the sunset with the heat of the day. West-facing panels are a good option when installed correctly for the proper roof. For those that live right against the Wasatch Mountains on the east, having panels on the west side of a home allows maximum efficiency because the sun is generally behind the mountain until 10 a.m. Solaroo Energy recommended that for these types of installs, it’s important to have a local company with knowledgeable, skilled craftsmen who understand how to get maximum productivity from a west-facing installed system. North-facing panels are almost always at a disadvantage to the homeowner. Buyer beware: if a solar company recommends panels being placed on the north side of a home, it’s probably time to get a few more options or proposals from other solar companies. In addition to the roof orientation, there are other factors that play into which sections of the roof to install. These include tree and chimney locations, roof vents and other shading issues. When it comes to the tilt or pitch of a roof, homeowners should understand the most efficient path of the sun over the home. This determines how much direct sunlight the system will get in the summer and how much low and angled sun in the winter. According to Solaroo Energy, the most efficient angle in the summer months is roughly 16 degrees, which translates to 3/12 and 4/12 pitch. To get the most efficiency in the winter, the angle is roughly 64 degrees (about 24/12 pitch). 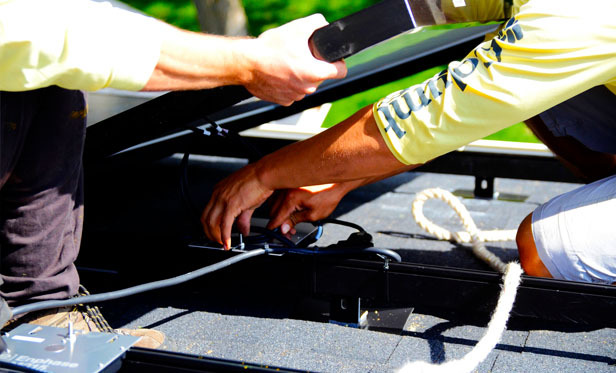 If homeowners do not know the pitch of their roof, solar experts work to determine this pretty quickly. Once they have the angle of the roof, they make an assessment on whether the roof can achieve maximum efficiency by assessing the total summer sunlight and the total winter sunlight a home will produce. The most efficient average angle is 28-35 degrees (roughly a 6-7/12 pitch). If the home is steeper or flatter than this, it does not mean solar won’t make sense; it just means it is more efficient at different times of the year. Considering the type of shingle on a roof has nothing to do with the production of energy, but it will determine the type of installation a home may need. Asphalt and aluminum shingles tend to be the simplest to install a solar system on, while tile shingles and corrugated metal provide a more challenging installation process. If the home is older and not equipped with trusses, there is a possibility you will need to install structural braces in the rafters to support the weight of the solar panels. These modifications tend to be affordable and are critical to the process of successful installation. If you would like more information then provided in this article or if there are additional questions about solar energy, please visit our website or call us at 801-826-4888.